The chronological and spatial context of the life of Sister Maria de Ágreda corresponds, fundamentally, with the reigns of Felipe III and Felipe IV, a period of crisis and decay. Spain lived 17th century under the sign of the depopulation and the economic and social crisis, converging all it with the declivity in the international policy that it definitively relegated to the Hispanic Monarchy. The monarchs, weak and incapable, leave the government into the hands of valid ambitious. The governors of the 17th century inherit a not pleasing situation. 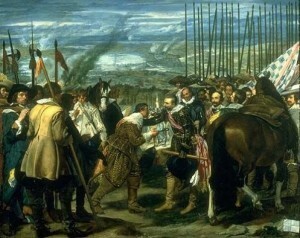 Spain faces the revolt of the Netherlands and the fight against France and England. In order to face everything, the monarchs rely on an impoverished country, in crisis and a mortgaged estate. The reign of Felipe III (1598-1621) was an interval in the big warlike conflicts with which 16th century finalizes. A pacifist tendency directed by the Duke of Lerma, privileged of the kingdom, imposed by the financial crisis. The peace with France is reached shortly before the death of Felipe III; in 1604 England signs also the peace; in 1609 there is signed, with the Netherlands, the Truce of Ámberes that will interrupt the hostilities during a period of twelve years. Nevertheless the peace did not serve to recover of the financial crisis. The necessity to support armies, the expenses of the diplomacy, the defense of the Mediterranean and the Indians, and a series of conflicts in Italy, caused that the military expenses were not inferior to those of the years of the war. The greed of Duke de Lerma and those in his favor led to a distribution of positions, titles and benefits among his favorites, which aggravated the situation of the public State Treasury. Felipe IV acceded to the throne in 1621, together with him and until 1643 there would be his valid one Don Gaspar de Guzmán, count Duke of Olivares, the most important political personality of the Spain of the 17th century. All his policy had as aim to conserve the prestige of the monarchy and to maintain the territories facing to the aggressions of the protestant countries and France, which inevitably would bring the war; in order to win it all the resources of the crown were necessary and also the reinforcement of the monarchy in front to the social privileges and the privileges of certain kingdoms and territories, which would carry the opposition of the high nobility and the revolts to him of Catalonia and Portugal in 1640. Abroad, Spain was involved in the war of the Thirty Years and in the Hispanic-Dutch war. The universalistic policy of the Austrias had direct repercussions on many economic and social aspects. The average governors had to resort to all kind of means to obtain money, such as the alteration of the currency, the sale of hundreds of towns of the royal patrimony, the sale of positions and the increase of the fiscal pressure. While the crown income descended, mainly the remittances of the Indians, the commerce with America underwent a strong crisis. The manufacturing and commercial activities became paralyzed. All this accompanied by the decrease of cereals production and a disaster of the cattle sector, specially the nomad livestock of the Mesta. During 17th century a demographic declivity took place. The expulsion of the moors, decreed in 1609, the emigration to Indians, the military losses, which had to the diverse fights, hunger, and epidemics are the most outstanding factors at the time of explaining the demographic depression. In addition other factors acted such as the reduction of the agrarian production, the industrial declivity, the cheating loans or the fled one from the peasants who meet forced to leave the land. All it leads to a depopulation of the fields and the emigration to the cities that soon were filled of crooks, needy, poor men and vagabonds. The society of the Spain of 17th century was strongly marked by the inequalities. Legal inequality between both privileged estates (nobility and clergy), that enjoyed penal advantages, fiscal, of reserve of municipal positions, etc opposite to the common people; inequality of fortunes and rents, that went from the aristocracy of the great proprietary financiers to the simple day laborers and laborers, passing by multiple intermediate situations, well-off farmers, merchants or craftsmen. However, neither the internal difficulties, nor the expensive international policy prevented the splendor of the Spanish culture that would be imitated and admired in all Europe.